I’ve received some freshly cut carbon from Artmattan Productions. That means it’s time for some new PepperF1SH builds, I’ve got plans for at least 3 more. Also seen in the photo above are some titanium screws purchased from AliExpress. My twig frame as seen mechanically assembled here is unproven, but was inspired by one I saw on RC Groups. I’ve got 1.5mm and 2mm thick versions. They’re stiffer than the 1mm PepperF1SH frame but I don’t know about durability yet. More to come when they’re flying.. In an effort to get content flowing here again posts will probably be higher in image content and short notes rather than long form articles. 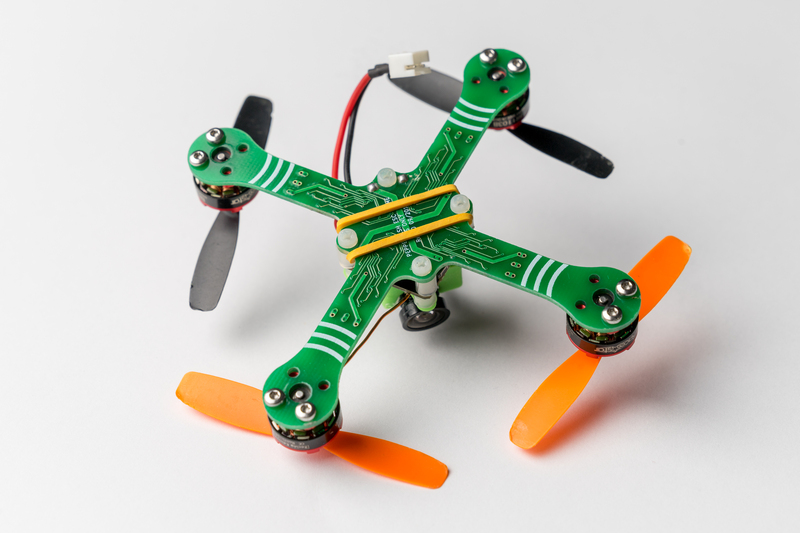 As such this is my latest quadcopter build. 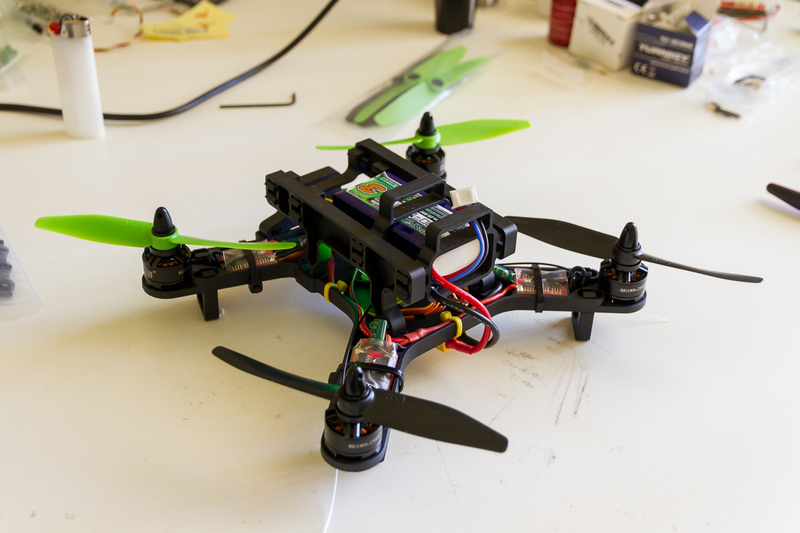 A micro 1S quad based on the excellent work of http://fishpepper.de. 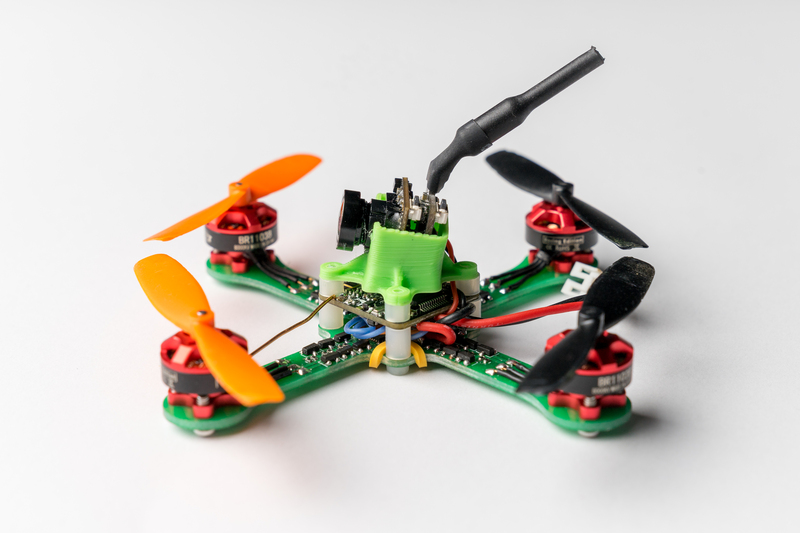 I have used the tinyFISH Flight Controller directly so nothing amazing on my part there (thought the FC itself is an amazing accomplishment). My point of difference, and the reason for this post is the ESC frame. 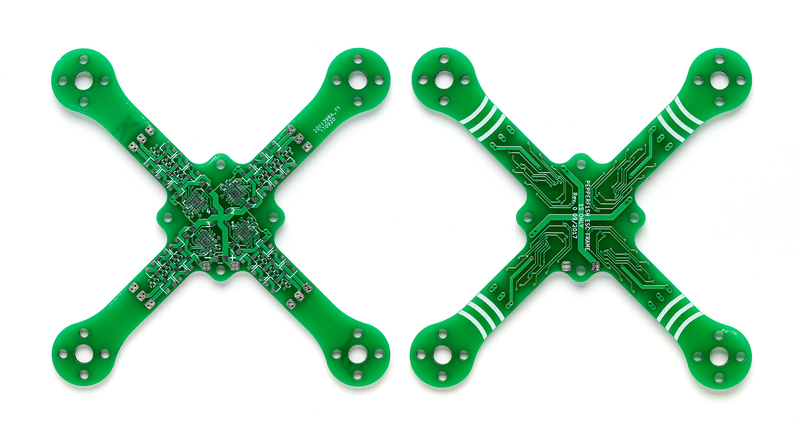 I have created a new board layout which uses the schematic of the tinyPEPPER 4-in-1 ESC but laid out on a PCB that serves double duty as the frame for building the copter on to. My initial motivation for this creation was to avoid the wait time of a custom carbon frame being cut. With the time spent on this layout and delays in production I could of just as quickly gone down the more traditional route but this was a fun project and I picked up some new skills. 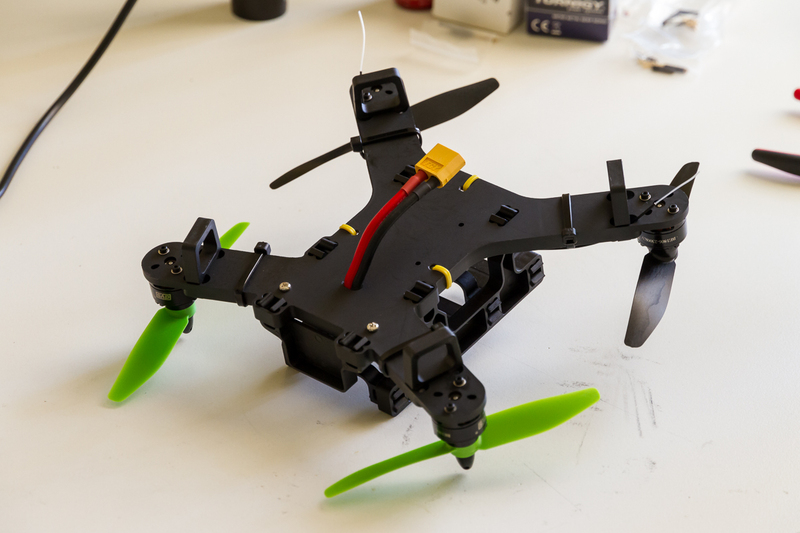 With the tiny size of this copter the frame fits within the common 100×100 size limit of cheap PCB fab houses. I used JLC PCB as a test this time around and for $20 I got 10 PCB’s with 2oz copper. Unfortunately the delivered spec. was not what I was after. The board is 1.6mm rather than 1mm (so much extra weight!) and the solder mask could only be green, the sticking point being the 2oz copper. 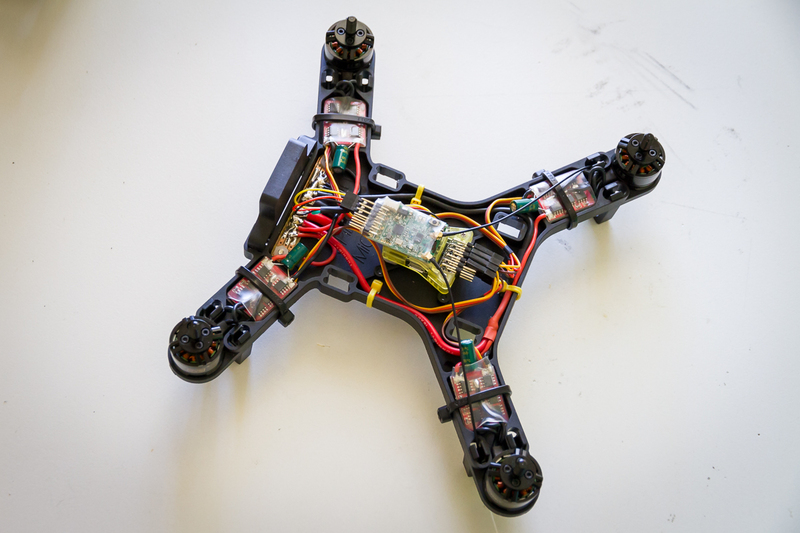 In any case it flies as is, there were no problems electrically with the PCB. Assembling the tiny components was challenging my first time around but became easy enough even though I’m only using a soldering iron, hot air rework station and wire solder. As required by the terms of the CERN open hardware license v1.2 my source files (KiCad) are available under the CERN open hardware license v1.2. Feel free to use the design – but make sure to give proper credit and release all modifications under the same license! 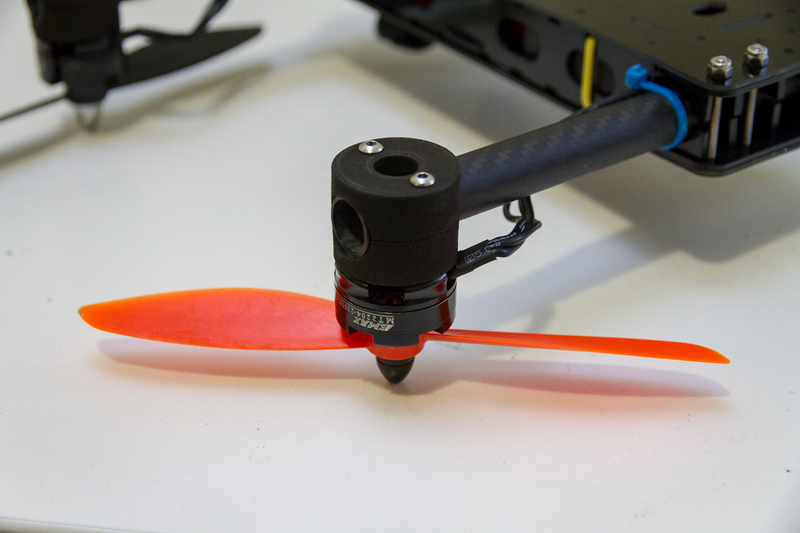 I modelled a new mount for the FPV camera which better suits FDM printing (no support required) and puts the lens on the centre line. There is also a bit more space withing it as I was finding the fishPEPPER designed option just wasn’t fitting the camera I had. 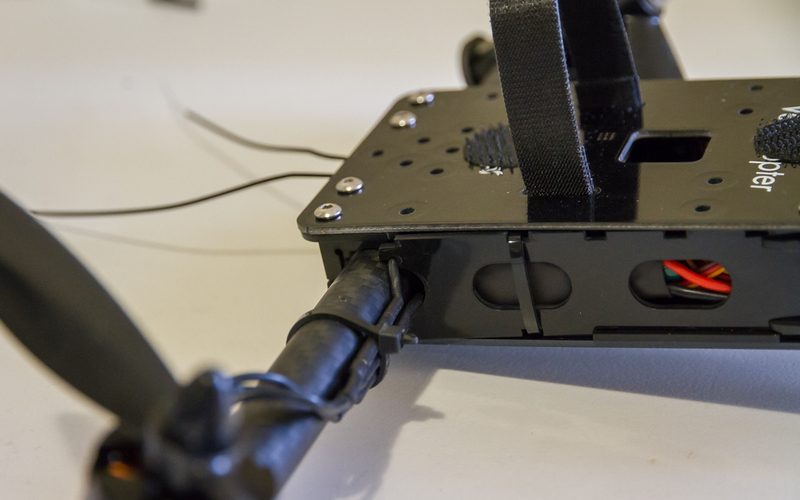 A small dab of hot glue in the bottom of the mount ensures the camera stays put. It is available on Thingiverse. To simplify the routing for the PCB fabrication I mount the battery with a rubber band that loops around the standoffs for the flight control stack. I already have parts and plans for another 2 builds. 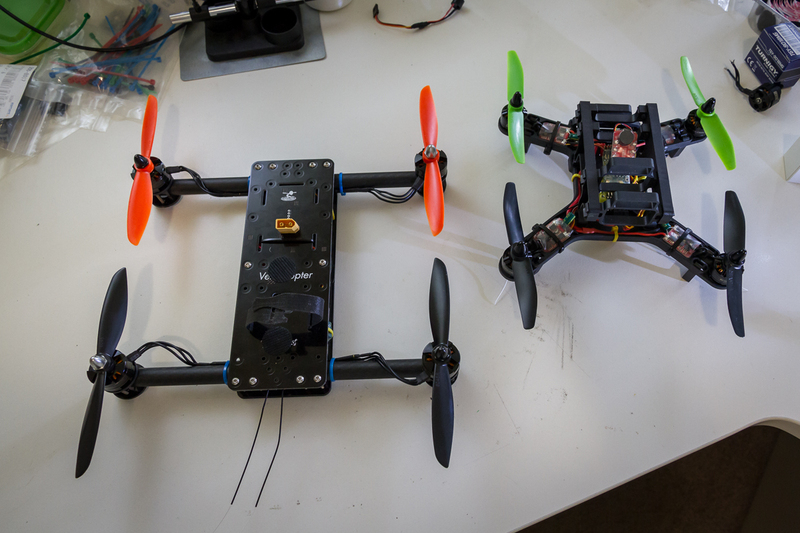 One will be with this same ESC Frame but using 10000kV motors and another will be using the recommended 8000kV motors on a carbon frame (either my own design or the PepperF1SH design). I’d also like to get another run of boards from a different fab house in 1mm thickness and build a 2S version but that is a little further down the track. I’ve also got a number of other custom designed but larger scale copters that will eventually find there way onto these pages. So many projects, such little time! 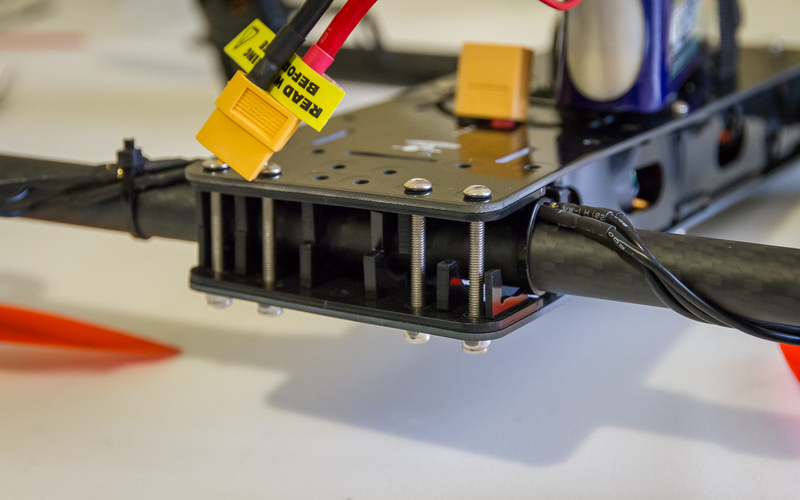 Through the cumulative effect of multiple crashes and initially over tightening I managed to snap one of the G4 plates that make up the motor mount tube clamps on the Flite Test VersaCopter. 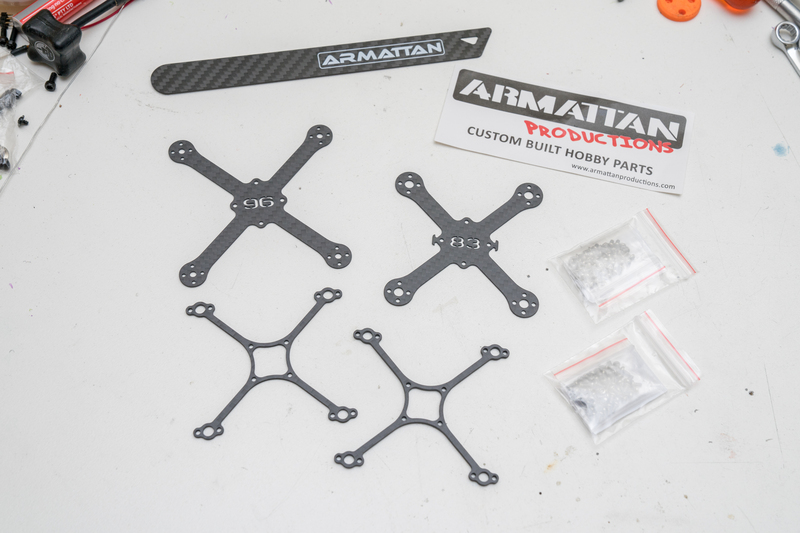 Unfortunately at the time I ordered the crash kit for the VersaCopter it didn’t twig that these plates were sold separately. As such I was faced with either making a very small order with Flite Test for replacements or coming up with my own solution. I took this as an opportunity to test my tube clamp motor mounting method and the folks over at 3dprint-au.com both of which are critical elements of the MultiChase project. I knocked up a very quick model of a direct replacement part for the Flite Test designed tube clamps and sent it off for printing. 3Dprint-AU use an SLS printer which I hope will provide better dimensional accuracy and a more homogeneous structure than a FDM style printer. The results are not as spot on as I expected but I generally found the parts are oversize rather than undersized. For example the bottom edge of the clamp, as shown above on the right, is raised rather than rounded as designed. A quick touch up with sandpaper (applied only to the motor side) brought the overall measured height down to the designed number. Also interesting to note here is that the ‘black’ material offered is actually just the white material dyed black on the outside. I’m not sure of the specifics of this process, if it is done by the print head or if it is done as a post process but it is something to bear in mind. To ensure a nice clean holes for the mounting bolts I actually printed the hole under size and drilled them out as appropriate, they are shown here as printed. The installation process was simpler than the flight test motor mounts as there are less pieces to hold together. I also think it looks cleaner than the original pieces. Strength wise I have no doubt that this well be less susceptible to the same style of failure as the original design. Everything is nice and snug with no visible deflection when tightening. That does however raise some concerns about the next failure. My mounts fit much more tightly around the tube and seem much less inclined to rotate as the originals would in a crash. This could make the frame itself or the arm tubes more vulnerable. 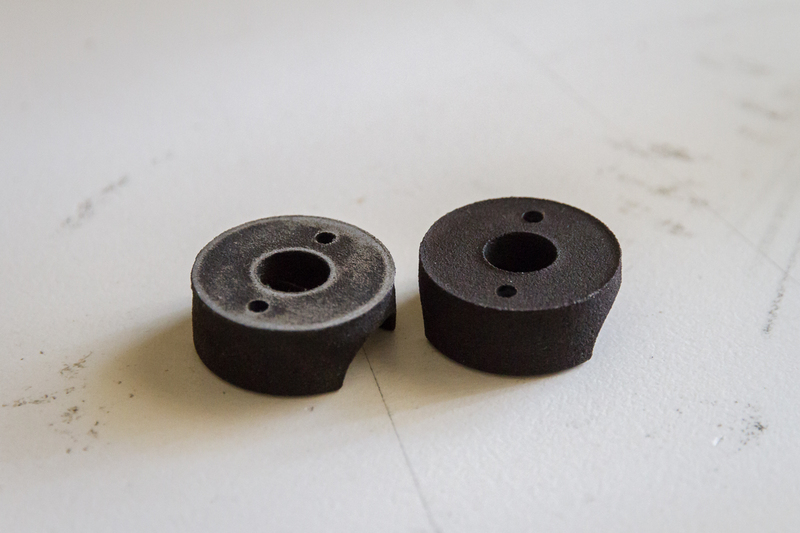 Despite the much bulkier appearance these mounts only add 1.7g per corner. 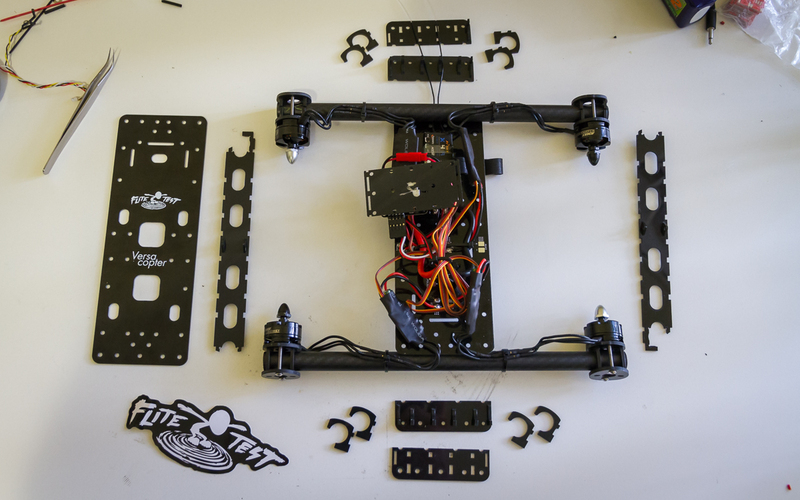 Each printed half weighs 4g for a total of 8g per corner whereas the Flit Test design weighs in at 6.3g per corner. Now it’s time to get this rig back in the air, it has been several weeks since I broke flew it last. After receiving my crash kits for the VersaCopter I have rebuilt it without any further drama. The only change made on the rebuild was to flip the orientation of the capacitors across the power input on the two ESC’s adjacent to the flight controller. They now rest back over the top of the ESC rather than poking out along the wires. As previously mentioned they were causing interference problems with the USB connector and various other connections on the flight controller. No such problems exist now. Also rebuilt over the weekend was the Spidex 220, when I last flew that I took off aggressively thinking it was in angle mode when in fact it was in rate mode. Needless to say the quad flipped on its head and smashed in to the ground. Thankfully nothing beyond the propellers was actually broken but the force of the crash was enough to pull it to pieces so I thought a full workbench rebuild was a wise choice to ensure there wasn’t any hidden damage. Now having them both built I could get a photo of them together for a size comparison. I also tried to get a buzzer working on the CC3D mini in the Spidex 220 whilst it was on the bench again but so far have not had success. The best way I have seen to achieve this is to move the buzzer output to motor channel 6 with a custom build of Cleanflight and a transistor to switch the buzzer. After having put everything in place as required it doesn’t work but I am unsure at the moment which piece of the puzzle is at fault. More investigation will be required. For now an external battery monitor on my new higher discharge rate batteries will suffice. As with the VersaCopter, at this stage i have built this up without any FPV or camera equipment, that’s an expense for the future. How to tackle power distribution and connection proved to be the biggest question of this build. Seen above is the solution I came up with which I think is really quite tidy. 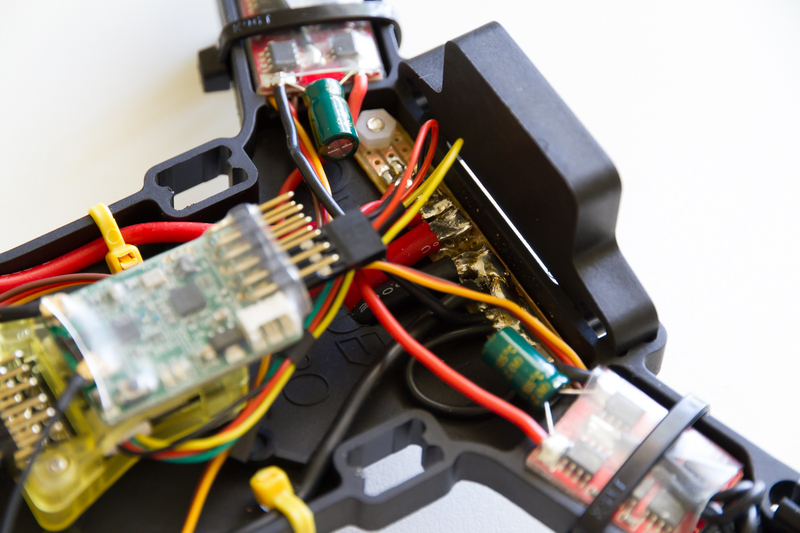 The rear two motors are joined together with another wire which travels forward to the power distribution board. In previous builds I have always been frustrated by the process of trying to solder multiple wires together, even two can be a frustrating experience. This time around I made a point of seeing how others tackled this problem and very quickly came across a wire wrapping method. The Flite Test crew illustrate it succinctly in the video below. Using this method, and even splitting it into two stages, I found the process much more agreeable. The +ve and -ve runs are mirrored with one up each side of the frame. A couple of holes were drilled into the base plate to hold zip ties in critical locations. 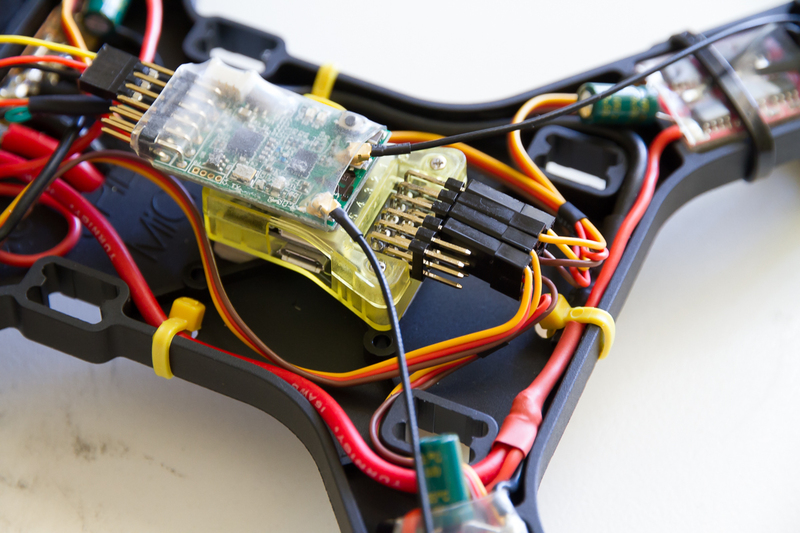 The wires from the rear motors meet the battery wires and front motors at this small power distribution board made from a piece of strip board. The copper strips aren’t really carrying much of the power it simply provides an easy foundation onto which each wire can be joined. Also hinted at in the photo above is the fact that I have routed the battery wires through the base plate. This seemed the only tidy way I could route them whilst providing enough tension that the battery leads be pulled out of range of the propellers. 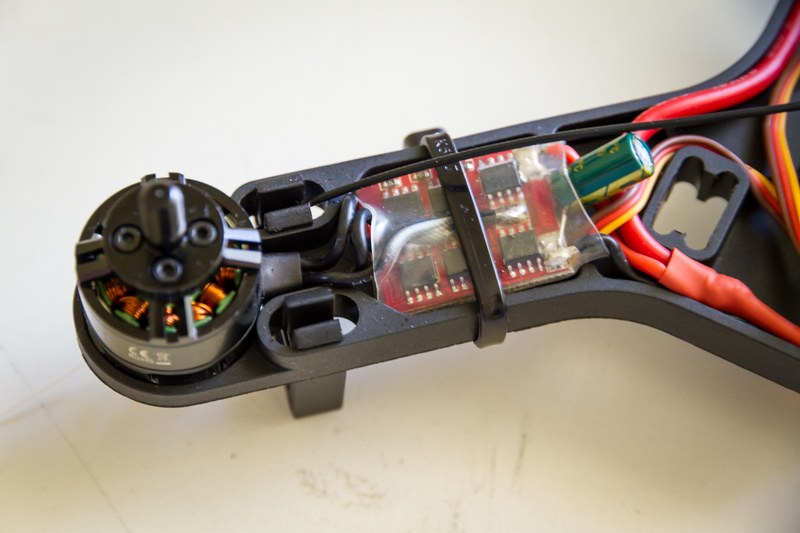 The battery connector flies freely out the bottom of the craft but is pulled taught when a battery is connected. To fit the FrSky X4R receiver between the flight controller and the battery I striped it of its carboard housing and replaced it with heat shrink, using double sided tape it is then attached directly to the housing for the CC3D mini. For a tidy install I also shortened the wires from each ESC. On all but one connector the +5v wire is also removed and held back with a small loop of heat shrink. 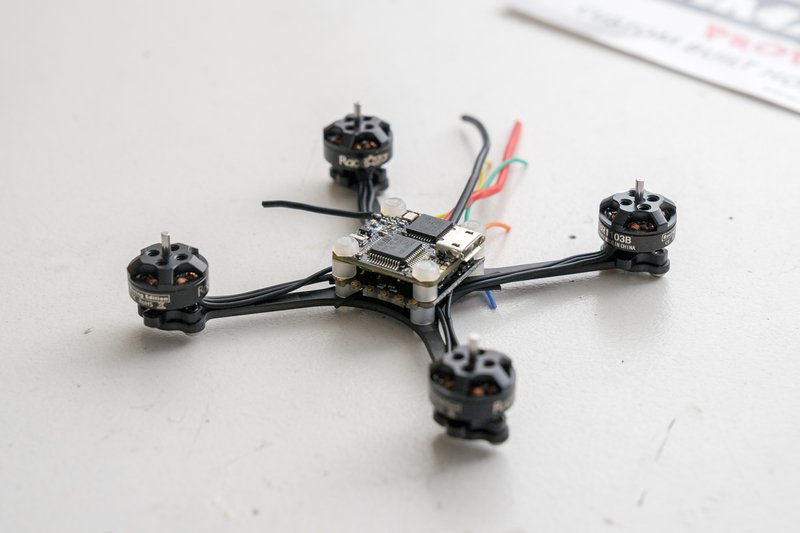 I have changed the software on the CC3D mini over to CleanFlight due to my familiarity with that. Installing it was quite simple using the OpenPilot bootloader and flashing software. In the future I would also change over to a CleanFlight bootloader as my experience with that on NAZE32 hardware is a little smoother. To fit the ESC’s in to the designated spots on the arms the outer corners of the ECS’s need to be trimmed slightly. A cut out in the cross member on the frame was also required to pass the signal wire from the bottom of the board. The motor wires are soldered directly to the ESC and by paying attention to which wire was going where I was able to get a pair of CCW rotating motors and a pair of CW rotating motors without having to rework the soldering. Initial flight impressions are a bit limited so far due to windy days but from what I have experienced it is a very punchy little rig. I am seeing some vibration induced instability/oscillation at hover which will need some work and the tuning could also do with a touch up. All in all though, a very fun little platform that I’ve picked up for minimal outlay. Up until now I had managed to avoid inflicting any serious damage on the VersaCopter despite a couple of unexpected visits to the ground. The first time it came down was when I clipped a post, judging depth and plotting a course is tough when flying around obstacles! From that a couple of small cracks developed in the side plates but everything could still be straightened and flown again. The second crash came when I fumbled the sticks whilst a couple of meters from the ground and couldn’t recover. Again, straighten out the alignment, replace broken props and it was back in the air. This illustrates the strength of the clamp-on-tube ethos. Allowing mounts to rotate certainly takes energy out of the crashes and also reduces the chance of motor damage. This crash was more severe. Essentially I ran out of talent, I was pushing limits further than I had previously and at the time I crashed I was flying high speed figure 8 circuits In very close proximity to the ground, less than 1m AGL for the most part. Upon rolling left to execute a turn I dipped the front motor to low and it caught the ground. The VersaCopter then proceed to tumble along on its side bouncing of the end of each boom for 4-5m. The first photo below illustrates what I was greeted with when I went to collect it. Everything was still together but evidently some more serious damage had occurred. The front boom was at an odd angle and the rear boom had shifted significantly. The motors had rotated to all sorts of interesting angles. Closer inspection revealed that all of the vertical plates around the front tube were broken and the displaced boom had bent the side plate in. Similar damage also happen to the rear end during the tumbling however everything stayed in essentially the right place. All of the vertical Delrin plates will need replacing to get this back in the air. Spread out on the table the this is what the damage looks like. Unsurprisingly the cracks all occurred at very thin sections of the frame. Thankfully, in anticipation of just such a circumstance I ordered a couple of crash kits several days ago so soon enough I will have the replacement Delrin parts to get it back in the air. I’m also interested to see what the Flite Test crew comes up with for the ‘stronger upgrades’ they are working on. 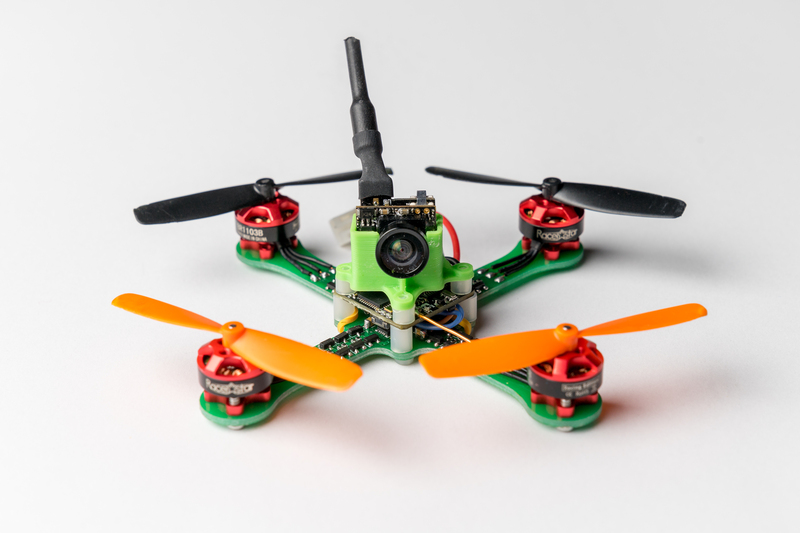 I’ve been on the lookout for a small quadcopter kit to put together for some time with an ultimate interest in getting in to FPV flying and racing. 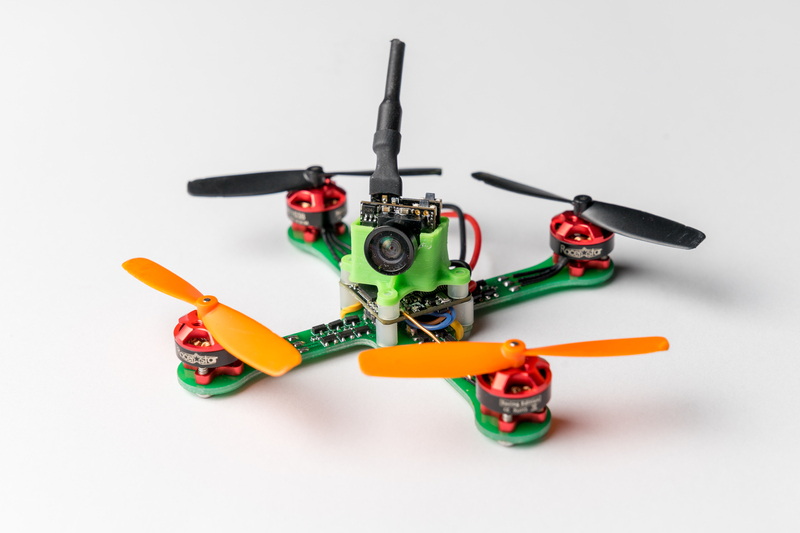 The high entry cost for a good quality full FPV setup has put me off a number of appealing options over the last 12-18 months such as the ImmersionRC Vortex. 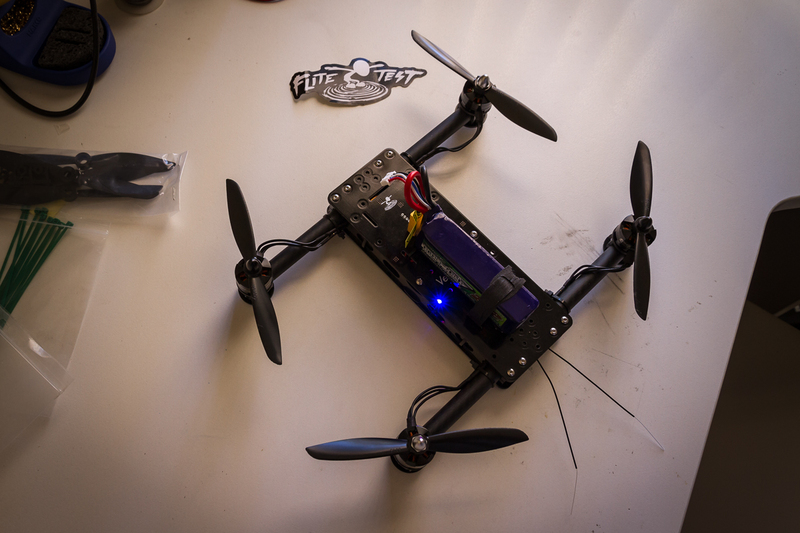 I have however finally pulled the trigger on the VersaCopter created by the crew over at Flite Test. This will allow me to put together a rig piece by piece and offers a compelling value proposition. 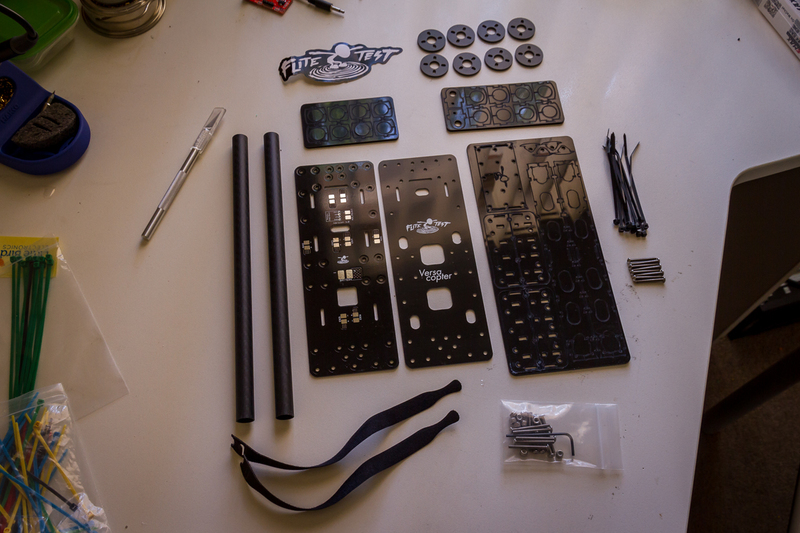 A couple of days ago my kit arrived so over the weekend I have assembled and flow my VersaCopter. The only missing piece from this shopping list to get off the ground is a radio receiver to suit, in my case, a Taranis X9D. 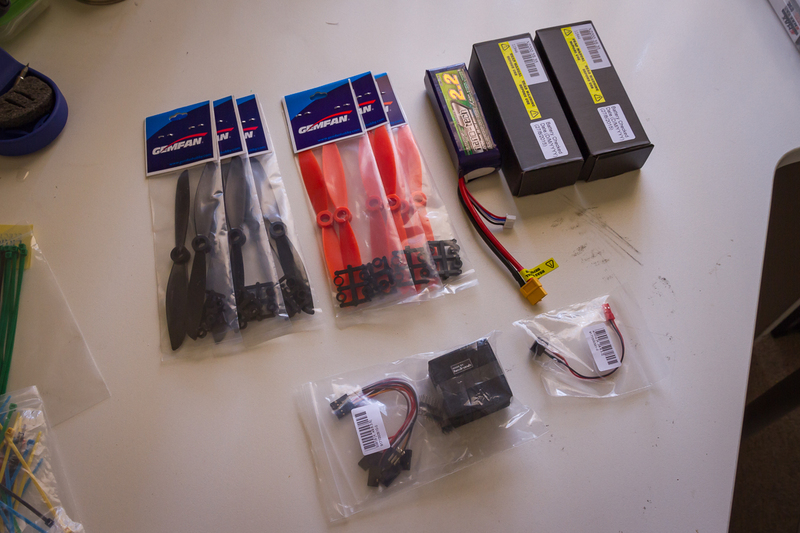 I already had a couple of FrSky X4RSB‘s on hand from a previous order. One of the reasons I was so eager to jump on this kit was the design style used. The slot together laser cut plates really appeals to my sensibilities and I was curious for a close up look at what laser cut Delrin looked like and offered structurally. I have used similar construction methods in the past for other projects but have always used acrylic (unfortunately Ponoko NZ, whom I usually use, do not offer a Derlin option). When installing the motor mounts on to the arm I found it easiest to start only the bolt on the side opposite the slot. This allowed full freedom for the Delrin part to stretch over the tube before adding the 2nd bolt. Aligning the motors on opposite ends of each arm proved more challenging than ensuring the front and rear motors were aligned. I didn’t come up with any clever solution to this beyond align, tighten, check, repeat. The wires and capacitor interfere with access to the USB port through the side window. The length meant it was particularly tight trying to fit the ESC between the NAZE and the rear arm, consequently the ESC is in constant contact with the edge of the NAZE board somewhat nullifying the foam isolation mounting of the flight controller. Ultimately the compromise was to push the ESC as far back as possible and hold the input wires down as best as possible with an extra cable tie. 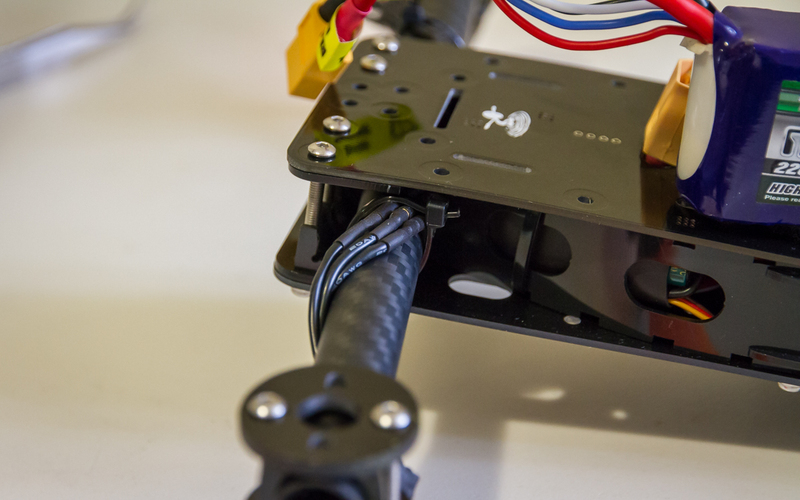 With about 4-5mm of foam under the NAZE 32 there is not sufficient vertical space within the frame for vertical connectors. This impacts the telemetry, vBatt, buzz and serial ports. Directly wiring JST tails to those I wish to use will be required. As I am using the SBus output from the receiver I had to set serial port 2 on the NAZE 32 to serialRX. I overlooked this detail and spent some time trying to figure out why I was not receiving a signal. I was not happy with how secure the battery felt with just the velcro strap as such I added some Velcro dots to the top of the frame and bottom of the batteries for extra security. 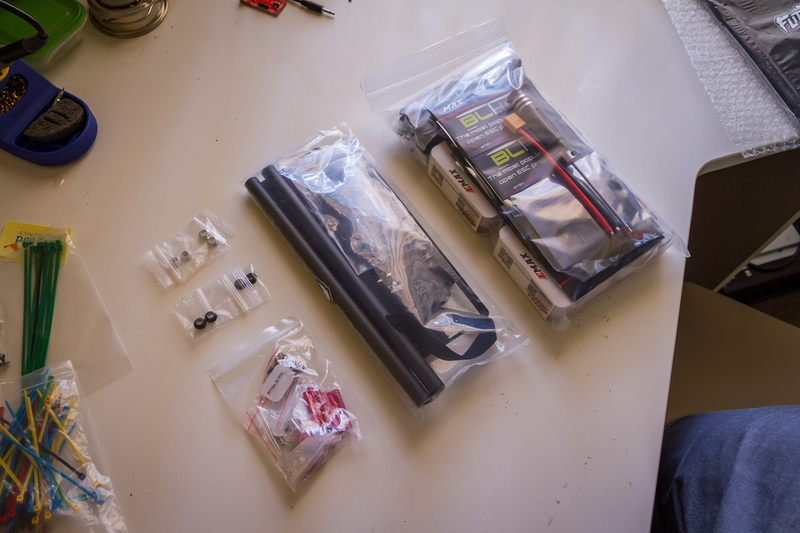 Ultimately the kit went together very well and they have certainly delivered on their aim of putting together a DIY kit that looks professional and tidy when completed. After running through 6 batteries I can say that I am very happy with the VersaCopter and it delivers all that I had hoped. 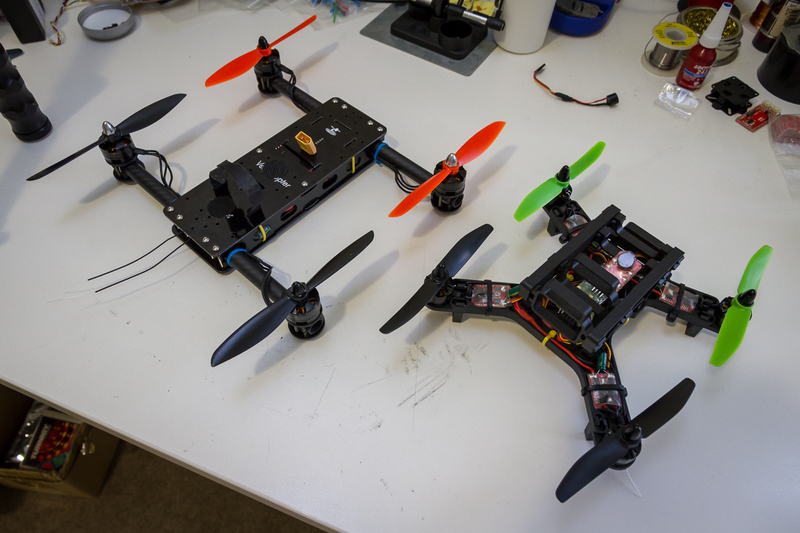 Specifically a no nonsense quad with decent flying performance, i.e. something that will allow me to practice flying with minimum fuss. 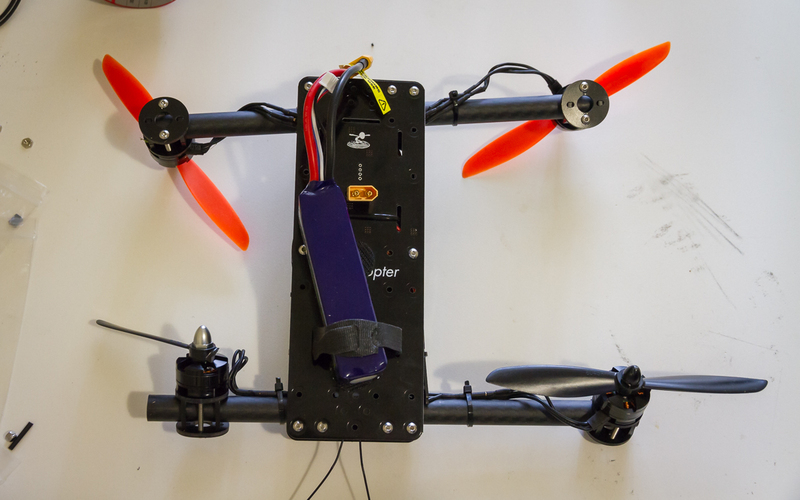 With this setup flight times of between 7.5 – 8 minutes are easily possible with relatively energetic flying (constantly on the move, regularly at full throttle, flying square or figure 8 circuits) and approximately 10-15% left in the battery. So far I can not report on the durability of the frame, I haven’t crashed it yet. As a foot note there are a couple of lessons to be taken from this build for my MultiChase project. 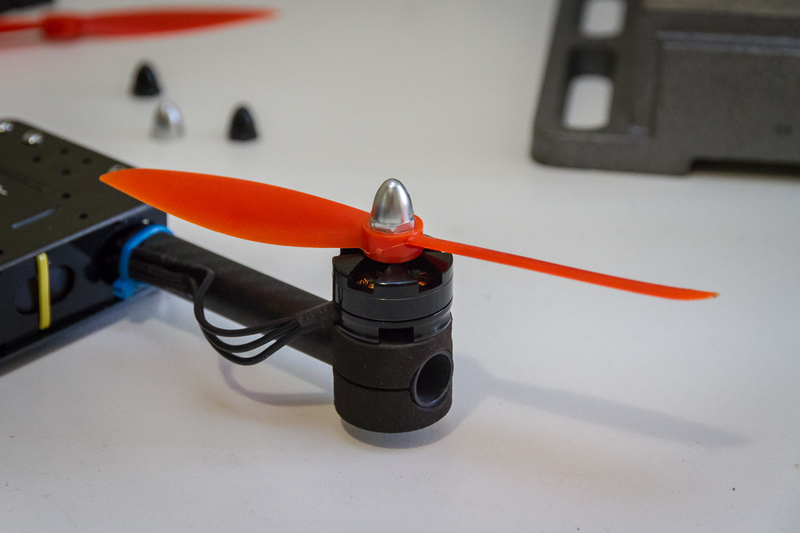 With a 6″ propellor the difference between a 250mm and 280mm motor centre is probably fairly minor. The laser cut plates method of construction proved very simple to put together and supported by the fibreglass plates provides a very strong frame, it is probably worth reconsidering for as an option. 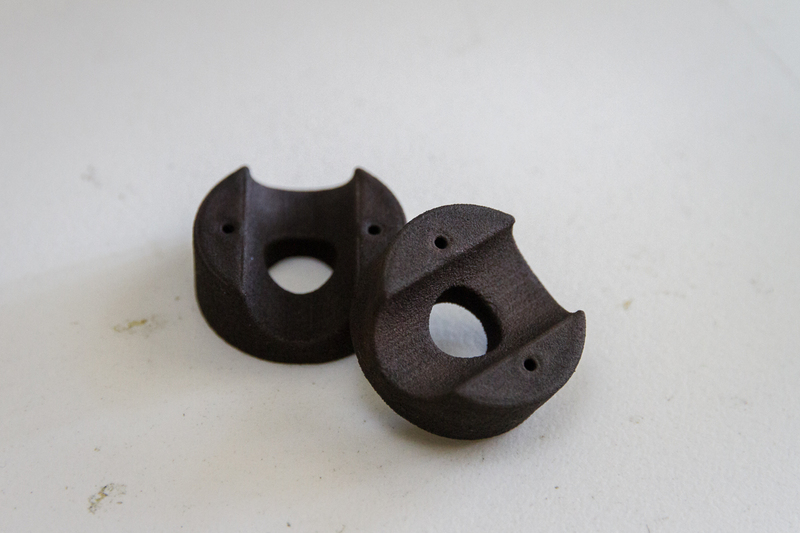 Delrin looks to be a great material in this laser cut form, tough but still somewhat flexible. I will however continue with my 3D printing approach for now as that is easily available to me.